PAR Everserv PixelPoint POS for Windows fully integrated software for table service and quick service (QSR) is unmatched for reliability, flexibility and ease-of-use sets a new benchmark for POS software in today's "high tech" hospitality environments. PAR Everserv PixelPoint Restaurant Point of Sale Software is much like a POS environment. This one unique software suite can deliver a solution regardless of your specific vertical market. Whether you’re running a fine dining restaurant, a quick service chain, a demanding pizza delivery operation, or even a high volume bar, PAR/PixelPoint POS software can be configured to meet your needs. Expect to improve your guest experience and your bottom line with PixelPoint POS software, a solution designed to be amazingly easy to use, brilliantly flexible and rock solid reliable. Intuitive and concise screen layouts allow staff to enter orders with maximum efficiency so they have more time to focus on delivering an outstanding guest experience that will create loyal guests. Powerful BackOffice features let managers track sales, manage schedules and control inventory costs. Everserv PixelPoint can be easily configured to work in any restaurant environment from fine dining to fast causal and adapts as your needs change. Designed to work in harmony with any hardware platform and built using an extensible software architecture ensures all PixelPoint modules work together seamlessly, eliminating costly integration and support fees. Most importantly, Everserv PixelPoint can help you deliver a rewarding experience for your guests, as it is simply easier to train your staff on, easier for your staff to place orders quickly and accurately, and easier for your managers to accurately track and compile sales and inventory information. Manage your food costs and inventory with standard and perpetual features. Accomplish everything from tracking product sales to product usage and inventory usage and easily create and receive purchase orders. Stop reacting and start preventing incidents by receiving text or e-mail messages of events the instant they happen. You are able to configure the POS system to notify you when an item needs restocking, when the check on a table exceeds the average, when an employee reaches overtime hours and more. Increase your profits by up-selling to combos. PixelPoint automatically recognizes potential combos as items are ordered and uses suggestive selling pop-up buttons to ensure employees never miss the opportunity to up sell a combo. Save time and trouble by configuring common end of day POS processes to occur automatically. Eliminate the problems caused by employees not clocking out, tables not being closed and credit card batches being forgotten. Improve the guest experience and communication between front and back of house staff when orders are sent to the kitchen by course. Kitchen staff operate more efficiently and with fewer errors when they know when to prepare food. Seamlessly project POS menu items onto LCD displays with high-quality multimedia to turn your menu board into a dramatic, interactive sales and marketing tool. The PixelPoint menu board displays information in near realtime, so your menu board continually updates throughout the day with menu changes, scheduled price changes, daily specials and HeadOffice updates. A great way to increase sales and motivate employees, straightforward set-up and automatic tracking make administration a breeze. Run contests according to job position, menu category and date range. With no separate software required, adding a Kiosk to your restaurant has never been so easy. PixelPoint Kiosk is designed to cut down on labor costs and speed up the ordering process, enabling a whole new level of profitability. The kiosk will pull menu items directly from your menu database on the POS terminal, providing a seamless integration into your POS system. Keep your labor costs in check and increase employee performance by efficiently and effectively managing your time and attendance information. Our integrated features allow for easy schedule access, multiple job positions for each employee and even forecast staffing levels. Look forward to driving more business from your best customer with strong customer loyalty tools, that give you the ability to track your customers’ usage, create marketing promotional programs, award rewards and manage coupons based on the products they purchase. Built to accommodate the most demanding of menu layouts, PixelPoint’s simplified menu designs make it easy to design unlimited menus for any restaurant environment or simply add items on the fly. PixelPoint uses the powerful Sybase database engine to provide you with a fast and reliable POS environment. PixelPoint POS can be installed and excel in your establishment regardless of the concept. PixelPoint POS can easily handle table service, quick service, drive-through, delivery, catering, bars, nightclubs, stadiums, theme parks, anywhere you serve food and drink PixelPoint POS can help you do it more efficiently. With over 250 standard reports you have the data necessary to make the right business decisions that will increase your profits. Whether it’s a simple daily Crystal Report or in-depth analysis using DataMiner, PixelPoint POS delivers the reports you need. PixelPoint supports dual-screen hardware, offering a customer display that is ideal for counter service and-or quick service restaurants. 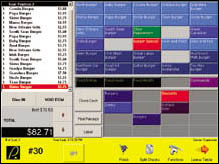 Using PixelPoint’s powerful Form Designer tool you can design your order confirmation and display screen to promote cross-selling and combos when the customer reaches the counter, and have it switch to an order confirmation screen as the customer places the order, insuring order accuracy. Maximize your table turns and keep your customers happy with customer paging, seat warning, and reservation features. Use detailed table status indicators to know if a reservation is late, what course is on the table, if an order is overdue and the current check value of every table. Accept all transaction types, including cash, credit card, check, gift card redemption and personal or corporate accounts. PixelPoint POS is PA-DSS validated so you can operate with peace of mind knowing your POS system is PCI compliant. Expand your restaurant’s reach and increase sales with a proven out-of-the box e-business solution. Seamlessly integration with PixelPoint POS means once an order is placed it is immediately processed, payment is collected, and printed in the kitchen. With our powerful SQL database at the back end your POS is stable as a rock, requires zero administration and is always up and available. Our software works on any hardware platform and our client/server architecture ensures you have the scalability and reliability you expect. Expect this software to easily adapt in any restaurant environment, with fully customizable menu screens, table layouts, screen flows, and thousands of POS features. Plus get more of the actionable information you need with a choice of hundreds of reports. Expect clear, user friendly and intuitive screen layouts and commands and a back office that simplifies day-to-day screen configurations. You can also run any feature, such as reporting, menu management or scheduling, from any terminal, allowing your staff to work smarter and faster.